Hello people of the internet!!! On today’s ‘Monday Memos’ we are going to discuss another topic that has been sweeping the internet lately. Now we all know that in the past few years, the problem of bullying in school and online has gotten considerably worse. This problem has also gotten a lot of attention from YouTube personalities, celebrities, and news stations. Sadly, many people have taken their own lives because they can’t deal with the insults, laughs, and stares that come with being bullied. So you might be asking “ok what does this have to do with this blog post?’. 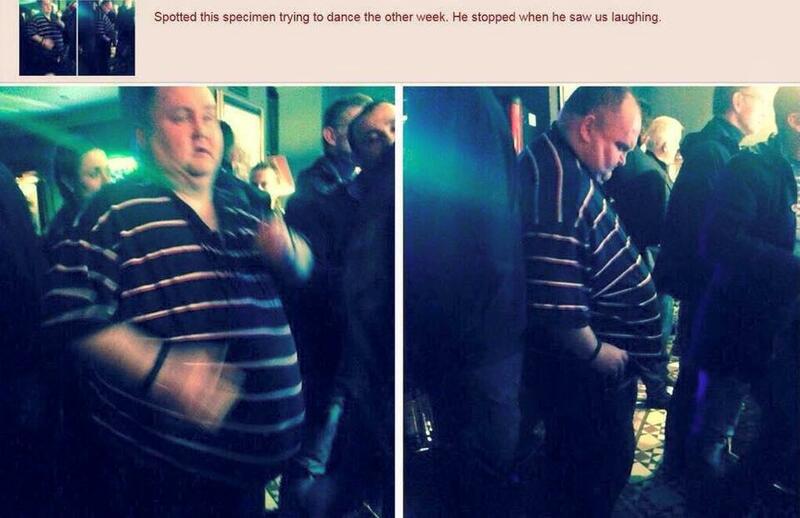 Well a few days ago, a picture went around the internet, that started a hunt for a man who was fat-shamed (which means making fun of someone who is overweight), while dancing at a club in London. When a woman in L.A. found out about this, she decided to take a stand in defense of this man, and the internet and celebrities soon followed. So let’s dive into the blog and find out more about the man everyone on the internet is talking about! After seeing the photo, Cassandra immediately took to Twitter and asked if anyone knew who the man was, because she and a LA group of women called the ‘Coconut Oil Friendship Club’, wanted to do something special for the mystery man. She began promoting the hashtag #FindDancingMan on Twitter, and her group set up a fundraising page so they could raise money to throw the man a huge dance party. Many celebrities such as: Pharrell Williams, Ellie Goulding, Cher Lloyd, Este Haim, and Moby have offered to attend and/or perform at the party, Spike TV’s Bar Rescue star Russell Davis has offered his bartending services, and The Los Angeles Coliseum has said that they will donate their stadium to host the event. The dancing man was later identified as a man named Sean, and now has a Twitter account (@dancingmanfound), which has over 65,000 followers (as of March 8th, 2015). Cassandra has said that she is in contact with Sean, and that they will decide on a date for the party when he returns to England from a business trip. The ‘Coconut Oil Friendship Club’s fundraising page has already raised $35,372 (their goal was $20,000) in 2 days, and they have said that any excess money that they raise will be donated to an anti-bullying charity. I think that it’s so cool that the world has come together to defend Sean, and help spread the message that no one has the right to ruin a person’s happiness just because of their physical appearance. This is also a good reminder that the golden rule we all learn as children is not a cliché we should just forget when we grow up. I think the great philosopher Ellen Degeneres put it best when she said, “Be kind to one another”. The events over the past few days have really put into perspective just what could be accomplished if we truly took these words to heart. dailymail.co.uk, eonline.com, gofundme.com, Sean, #FindDancingMan, Cassandra Fairbanks,4-can, The Free Thought Project, ‘Coconut Oil Friendship Club’, Spike TV, Pharrell Williams, Ellie Goulding, Cher Lloyd, Este Haim, Moby, Bar Rescue, Russell Davis, The Los Angeles Coliseum, Ellen DeGeneres, and all original owners. I do not own anything in this blog. If any people, corporations, businesses, companies, etc, were not previously given credit for their work, they are given credit now and their previous absence was unintentional. All opinions expressed in this blog are my own. I wrote this blog for entertainment purposes and no copyright infringement is intended. celindareyesblog March 9, 2015 1 Comment on Monday Memos: Meet Sean…the man who captured the internet’s heart. Category: Monday Memos. Tagged: 'Coconut Oil Friendship Club', #FindDancingMan, •dailymail.co.uk, 4-can, anti-bullying, Bar Rescue, Cassandra Fairbanks, Cher Lloyd, dancing, ellen degeneres, ellie goulding, eonline.com, Este Haim, gofundme.com, love, man, Moby, must see, pharrell williams, photo, picture, Russell Davis, Sean, Spike TV, The Free Thought Project, The Los Angeles Coliseum, viral.